For all dog lovers, this incredible story is sure to melt your heart. A dog was rescued after being found swimming in the Gulf of Thailand- for more than 220 kilometers (135 miles) from shore by oil workers. It has been returned safely to land. Workers on an oil rig noticed the head of the dog poking out as she paddled through the ocean last Friday. According to Deccan Chronicle, a worker on the rig belonging to Chevron Thailand Exploration and Production, Vitisak Payalaw, said on his Facebook page that they saw the dog last Friday swimming toward the platform. He said they were lucky to spot it because if there had been waves it probably would not have been visible. The dog was delivered by boat on Monday to the southern port of Songkhla and was declared in good shape after being taken to the animal protection group Watchdog Thailand. This page contains news relating to various facts and events. The views are generally about current affiars and general topics in diversified areas such as political, international, national, and regional issues, sports, health, travel, lifestyle, technology and business. People having similar interets on the above topics will find this page useful. 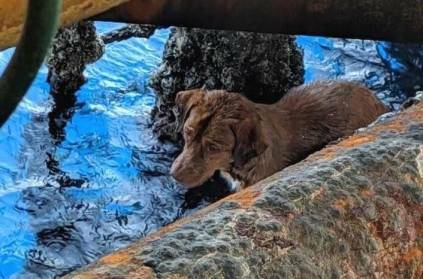 Stranded dog rescued 135 miles from Thai coast by oil workers | World News.